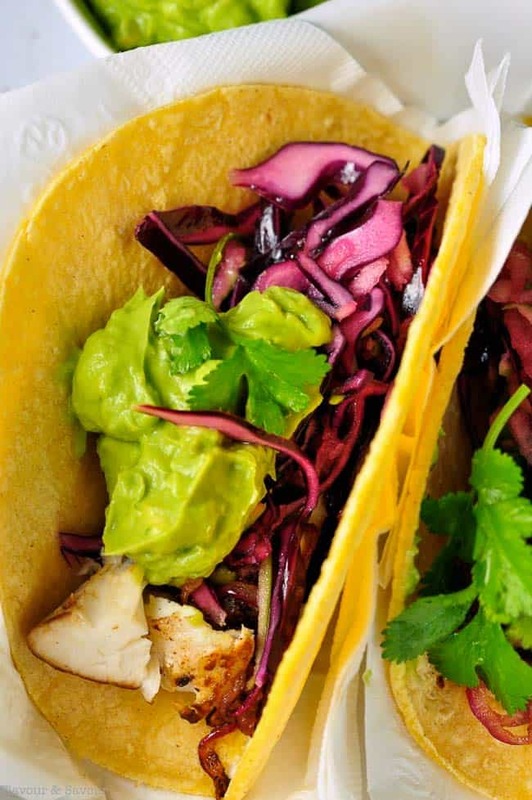 Tender flaky halibut cradled in a warm tortilla, smothered with a piquant red cabbage slaw, and topped with creamy guacamole—these halibut tacos make perfect portable hand food! These Halibut Tacos with Tequila Lime Marinade are an all-time favourite in our home. 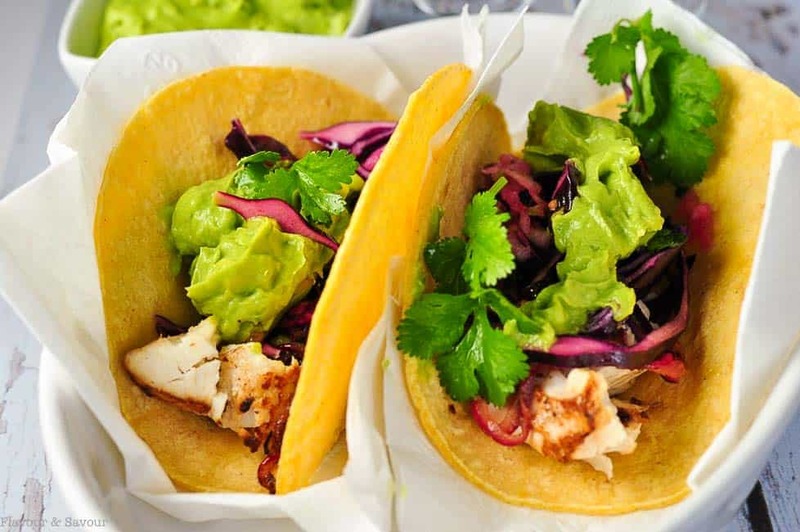 Tacos are a healthy alternative to hamburgers when you want a casual meal. Have you ever made a meal that you know you’ll remember forever? Years ago, while holidaying in Bamfield on the West Coast of Vancouver Island, the owner of a local fishing lodge arrived at our door just before dinner with two enormous bags of halibut fillets. It is not uncommon to land halibut that weigh over 100 pounds, and the lodge had more halibut than they could use to serve their guests. We were the lucky recipients of that excess. While I can’t recall the recipe I used, I do remember savouring that fresh-caught wild fish baked in a dish with fresh crab and a creamy sauce. We had plenty of halibut left over for the following night’s barbecue and much more to freeze and take home. I have to shudder when I think about how much I paid for an 8-inch chunk of halibut yesterday.
. This cookbook is my “company’s-coming-for-dinner” resource. I have made many of her recipes over the years, like this Shrimp Salad with Grapefruit and Mint and they are consistent show-stoppers. Looking at the list of ingredients and the instructions, it may seem like this recipe is a lot of work. And for a weeknight meal when you have hungry kids and you want dinner on the table in 20 minutes, it’s probably not the one to pick. But it would be a fun choice for an at-home date night dinner, when you’re both in the kitchen, sipping the tequila and creating a meal together. Or if you have friends who like to cook, ask two to prepare the marinade, and two to make the slaw while you whip up some guacamole and set out a taco bar with tortillas, sour cream, guacamole, and extra limes. Choose fresh corn tortillas with that masa aroma, or soft and chewy flour tortillas. We love halibut, but it is very expensive, so unless we have been lucky enough to have caught one, we only buy it occasionally. 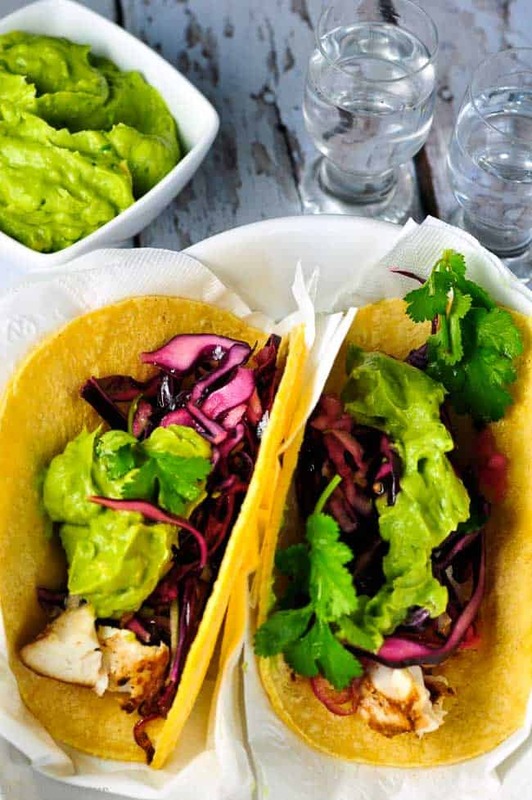 Making fish tacos is an ideal way to stretch a fillet. You only need a small amount of halibut as the tortillas are so full of other deliciousness. The combination of flavours in these halibut tacos is superb. Over the top. 10 out of 10. 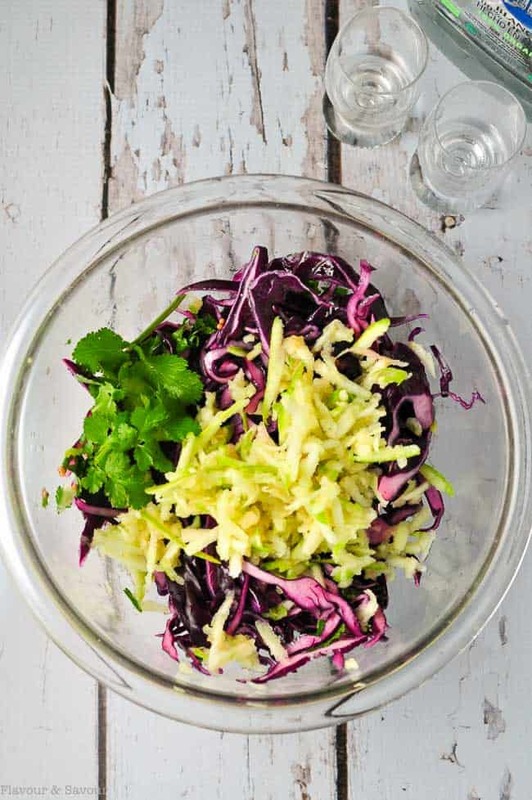 Prepare the red cabbage slaw first to allow the flavours to blend. Marinate the halibut in a mixture of tequila and lime with red onions and jalapenos. Remove the halibut from the marinade, lightly brown over high heat on both sides. Cook just until it begins to flake. Remove it from the pan, then put the reserved marinade in the skillet and cook until the onions and jalapenos are lightly charred. That charring intensifies the flavour immensely! Assemble the fish, the charred marinade ingredients, the slaw and top it off with some guacamole (or sour cream, if you like) and you have the makings of a meal you’ll remember for a long time. This seafood cookbook, Good Fish, has so many fabulous recipes and it also has links to several instructional videos that explain how to correctly prepare different kinds of seafood. In this video, the author shows her method for skinning a fish fillet. If you’re like me, and you hate it when someone hacks up a fillet when they remove the skin, try this method. It works like a charm. 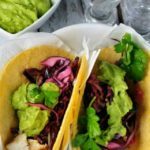 Tender flaky halibut, cradled in a warm tortilla and topped with a piquant red cabbage slaw and creamy guacamole makes these Halibut Tacos with Tequila Lime Marinade a meal to remember. Make the slaw. Toss the cabbage with the salt and put it in a colander. Put a bowl that fits inside the colander on top of the cabbage and fill it with water. Set this in the sink. The weight of the water will help to force the water from the cabbage and concentrate the flavour. In the meantime, mix the remaining ingredients in a large bowl. Then squeeze the cabbage, rinse it with cool water and squeeze again. Add it to the slaw ingredients and season to taste with salt. Set aside. To prepare the marinade, combine all the ingredients in a small bowl. Place the halibut in a glass baking dish, pour the marinade over the fillet and let it sit for 20 minutes. Make the guacamole by mashing the avocados with a fork and mixing in the remaining ingredients, or toss all in a small food processor. Cover to prevent discolouration until ready to serve. Heat a skillet over high heat, and add the oil. Remove the halibut from the marinade and cook for about 3 to 4 minutes or until browned on one side. Flip carefully and brown on the other side. Becky Selengut (cookbook author) has this perfect piece of advice: "Continue cooking until the fish is thinking about flaking, but not quite yet flaking, . . . about 8 minutes per inch of fish." The fish will continue to cook a little bit after you remove it from the heat. Put it on a platter and add the reserved marinade to the pan. Cook until the liquid has completely evaporated and the jalapenos and onions are lightly charred. Then put the marinade back on top of the fish. Arrange your taco bar ingredients, assemble, and serve . . . with tequila, of course. This post contains affiliate links. If you click on any of the affiliate links and make a purchase within a certain time frame, I’ll receive a small commission. The commission is paid by the third party, not by you. Flavour & Savour is a participant in the Amazon Services LLC Associates Program, an affiliate advertising program designed to provide a means for sites to earn advertising fees by advertising and linking to amazon.com. Funds earned simply help me to offset the costs of operating this blog and sharing recipes with you, my readers. You bet! Next time you’re down here, that’s what will be on the menu.